I will take 15 gorgeous photos of you and your date and even retouch them at no extra charge! After that, you'll get to choose your favorite photo to receive 2 8x10's, 2 5x7's, and a set of 16 wallets! 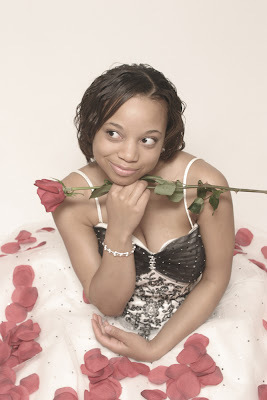 During this 30 minute session, I will take 20 beautiful photos of you and up to 7 of your friends. We'll be sure to get a few group poses, some of individuals, just the couples, and whatever other poses you want. After the session, everyone in the group will recieve a single 5x7 of their favorite photo. After that, anyone can order any extra pictures they want off the regular price list. Don't want any couple or group photos? Then this is the session for you. It includes 30 minutes of my time spent photographing you in your prom dress. I will take at least 10 gogreous photos in a variety of scenes here at the studio and will even retouch them at no charge! After the session you will receive a single high quality 4x6 proof of each picture! From there you can order any additional prints off my regular price list. My studio is located directly behind Belleville East High School, so it's easy to find. Sessions are done here at the studio. The indoor studio can accomodate groups of up to 10 people. We also have a beautiful 2 acre yard with pleanty of space for larger groups. Call Larissa 618-409-1224 or email larissamcdowell@yahoo.com to book your appointment now!